Apparently this person thought that in less than four months on the job, she should have been able to totally control Washington D.C. as opposed get it to start moving in the right direction. You know the type. With each thing accomplished the first reaction is to demand why a person has not accomplished the next thing while, and in asking the question, the questioner either did not notice, or chose to ignore for the support of their own disproved opinion any movement. Last week Warren vocally objected to President Obama's nominee for trade representative, and did so because of Michael Froman’s refusal to share information about details of the Trans-Pacific Partnership Agreement. She said that he had declined to provide assurances that he would release certain information about trade talks with Asia-Pacific countries. The Obama administration is reportedly pushing for an agreement that will give corporations sovereignty over local governments. Certainty on this is not possible because no one who's seen the agreement is allowed to talk about it. Next month there are going to be talks with the European Union, and Senator warren is not keen on the idea that there will be yet another secret agreement that will affect the people of America while they do not know any details. Senator Warren wants more transparency from Froman about the Trans-pacific Partnership, or we will have two major deals about which the public has no information. “I rise today to talk about trade agreements and the impact they have on our economy. Trade agreements affect access to foreign markets and our level of imports and exports. They also affect a wide variety of public policy issues – everything from wages, jobs, the environment, and the Internet — to monetary policy, pharmaceuticals, and financial services. “Many people are deeply interested in tracking the trajectory of trade negotiations, but if they do not have reasonable access to see the terms of the agreements under negotiation, then they can’t have real input. Without transparency, the benefits from an open marketplaces of ideas are reduced enormously. I am deeply concerned about the transparency record of the US Trade Representative and with one ongoing trade agreement in particular — the Trans-Pacific Partnership. For months, the Trade Representative who negotiates on our behalf has been unwilling to provide any public access to the composite bracketed text relating to the negotiations. The composite bracketed text includes proposed language from the United States and also other countries, and it serves as the focal point for negotiations. The Trade Representative has allowed Members of Congress to access the text, and I appreciate that. But that is no substitute for public transparency. I have heard the argument that transparency would undermine the Trade Representative’s policy to complete the trade agreement because public opposition would be significant. In other words, if people knew what was going on, they would stop it. This argument is exactly backwards. If transparency would lead to widespread public opposition to a trade agreement, then that trade agreement should not be the policy of the United States. I believe in transparency and democracy, and I think the U.S. Trade Representative should too. Third, I asked Mr. Froman if he would provide more transparency behind what information is made to the trade office’s outside advisors. Currently, there are about 600 outside advisors that have access to sensitive information, and the roster includes a wide diversity of industry representatives and some labor and NGO representatives too. But there is no transparency around who gets what information and whether they all see the same things, and I think that’s a real problem. Mr. Froman’s response was clear: No, no, no. He will not commit to make this information available so the public can track what is going on. I am voting against Mr. Froman’s nomination later today because I believe we need a new direction from the Trade Representative — A direction that prioritizes transparency and public debate. The American people have the right to know more about the negotiations that will have dramatic impact on the future of the American economy. And that will have a dramatic impact on our working men and women, on the environment, on the Internet. We should have a serious conversation about our trade policies, because these issues matter. But it all starts with transparency from the U.S. Trade Representative”. 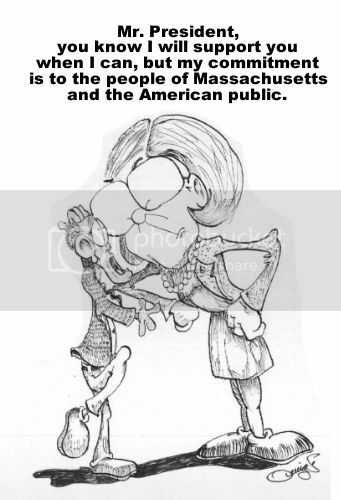 It would appear that rather than follow the party line and blindly do what the president wants, Senator Elizabeth Warren questions actions that go against the best interest of the people. I know, "Yeah, but what about...........?"